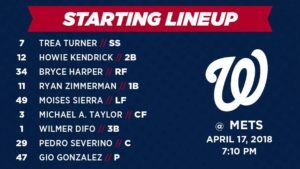 The Washington Nationals take on the New York Mets today at Citi Field on April 17th, 2018. The Nats won the first game of the series by a score of 8-6 in a comeback fashion. The pitching matchup for today’s game is LHP Gio Gonzalez(1-1, 2.20 ERA) taking on RHP Zack Wheeler(1-0, 1.29 ERA). Here’s the lineup for today’s game. 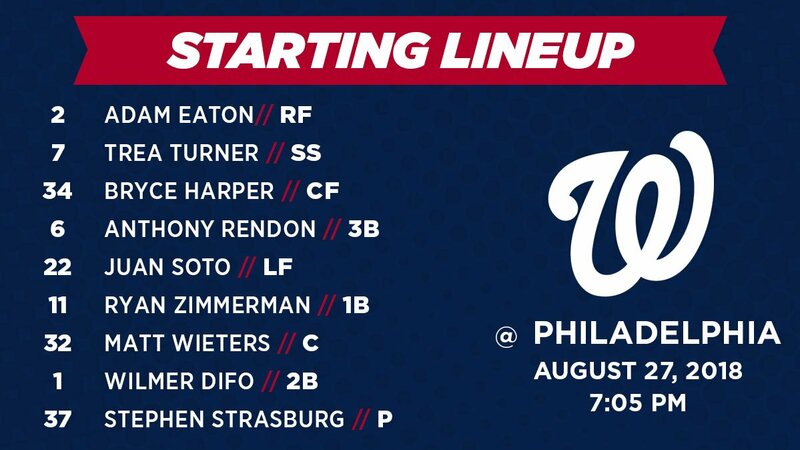 The lineup is as follows, SS: Trea Turner, 2B: Howie Kendrick, RF: Bryce Harper, 1B: Ryan Zimmerman, LF: Moises Sierra, CF: Michael A. Taylor, 3B: Wilmer Difo, C: Pedro Severino, and P: Gio Gonzalez.